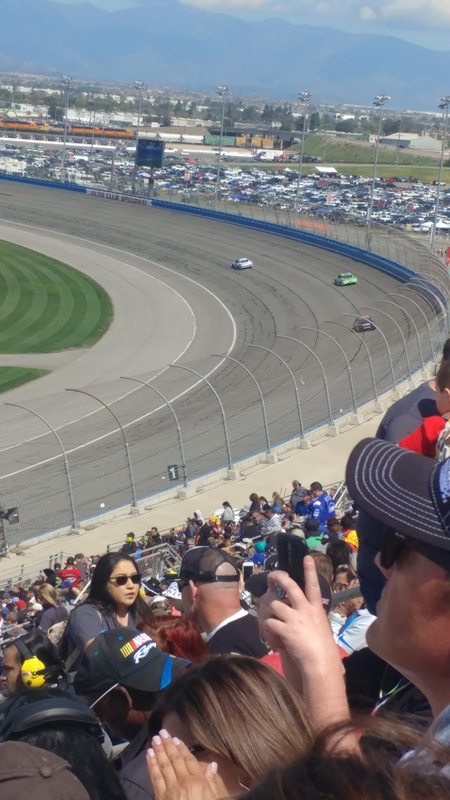 Trevor Bayne picked up the 6th last-place finish of his Monster Energy NASCAR Cup Series career in Sunday’s Auto Club 400 at the Auto Club Speedway of Southern California when his #6 Performance Plus Motor Oil Ford was involved in a hard single-car accident after 108 of 200 laps. 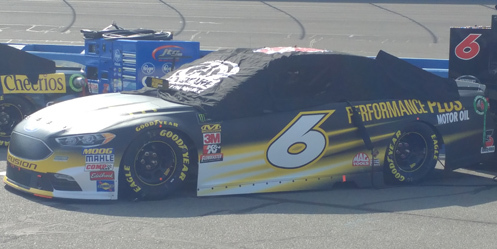 The finish, which came in Bayne’s 171st series start, was his first of the season and his first since September 4, 2016, following an engine failure during the Bojangles’ Southern 500 at Darlington. 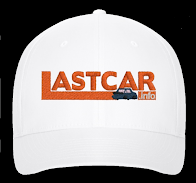 In the LASTCAR Cup Series rankings, it’s the 32nd for car #6, the 680th for Ford, and the 561st by reason of a crash. Across the top three series, it’s the 57th for the #6, the 937th for Ford, and the 1,131st by reason of a crash. Bayne, the 2011 winner of the Daytona 500, has continued to struggle in Roush-Fenway’s flagship team. While there have been flashes of brilliance – a pair of Top Fives in each of his last two seasons, he’s fallen well short of a spot in the Playoffs, finishing 22nd in the points both years. With his lone teammate Ricky Stenhouse, Jr. enjoying a breakout 2017 with a pair of restrictor-plate wins, Bayne is not only still looking for that elusive second Cup victory, but also the consistency to earn a spot in NASCAR’s postseason. Coming into Fontana, Bayne had shown some marked improvement. Other than Atlanta, where a late-race engine failure left him 35th, Bayne had finished a season-best 13th in the Daytona 500, followed by a pair of back-to-back 20th-place showings in Las Vegas and Phoenix, yielding a 21st-place rank in points. For the following race in Fontana, longtime sponsor AdvoCare (celebrating its 25th anniversary in 2018) would be replaced by Performance Plus Motor Oil, a company which joined the Roush effort at Sonoma in 2016. Bayne ran 28th among the 37 entrants in Friday’s opening practice and was fortunate to be one of the 24 drivers who managed to get through inspection quick enough to take time in qualifying. Bayne ran 15th of the 24 who ran in Round 1. In Round 2, he placed 13th, coming just eight-hundredths of a second short of bumping Brad Keselowski for a place in Round 3. With a qualifying lap of 184.743mph (38.973 seconds), Bayne would have his best starting spot since he rolled off 12th last fall at Homestead. The car continued to show speed against the full field in Saturday’s practices: he ran 20th in the morning session, then 22nd in Happy Hour. Starting last in Sunday’s field was Cole Whitt, who returned to driving TriStar Motorsports’ #72 Chevrolet for the first time since Las Vegas, two races ago. This time around, he carried backing from local car dealership SoCal Chevy. Owner Points ranked Whitt’s team lowest of the 13 drivers who were unable to get through inspection and, curiously, he was also last in line in the inspection cue during Round 1. Another four drivers didn’t turn a lap in Round 2: Front Row Motorsports teammates David Ragan and Michael McDowell, BK Racing’s Gray Gaulding, and Reed Sorenson, making his season debut in the return of Premium Motorsports’ Open car. Sorenson’s #55 Chevrolet didn’t have a primary sponsor, but carried associate backing from the LowT Centers and Champion Machinery, sponsors of Ross Chastain’s #15 with Premium’s Charter. 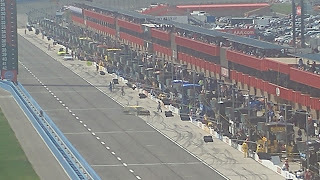 As the cars rolled off pit road, outside polesitter Kyle Busch pulled his car to the apron of Turn 1, then rejoined the field. Kasey Kahne followed suit, stopping his own #95 WRL General Contractors Chevrolet from the 34th spot just past the exit of pit road. Kahne stayed there for several seconds and only caught the tail end of the field at the conclusion of the first pace lap. Pre-race penalties were handed out to Gray Gaulding and Alex Bowman, who changed engines, to Michael McDowell for a rear gear change, and to Daniel Suarez, who wrecked his primary car when he snapped loose on the exit of Turn 2 in opening practice. Bowman, McDowell, and Suarez didn’t spend much time in the back as other cars also voluntarily fell to the rear. On the next pace lap, Whitt was still in the back, this time alongside Sorenson, who surrendered his 24th-place starting spot. With one lap to green, Gray Gaulding pulled high in Turn 1 to let traffic pass, at which point both Ross Chastain’s #15 and Rick Ware’s #51 Bubba Burger Toyota for Timmy Hill had done the same as well as Jeffrey Earnhardt in StarCom Racing’s #00 VRX Simulators Chevrolet. When it all shook out, Earnhardt was lined up last with Sorenson, Hill, Gaulding, Whitt, and Chastain occupying the next five spots. On the break, Earnhardt and Sorenson raced each other side-by-side into Turn 1, but Sorenson got the drive off Turn 2, dropping the #00 to last by Turn 3. Earnhardt gradually lost ground to the back of the field, and by the sixth lap he trailed the trio of Sorenson, Hill, and Gaulding by open track. On the 14th circuit, race leader Kyle Busch caught Earnhardt in Turn 1, then moved high to pass him, the first driver to lose a lap. By the 24th lap, Earnhardt had moved from the middle to the high lane, but was still losing positions. That time by, 27th-place A.J. Allmendinger worked his way past. Three circuits later, after pitting with the rest of the field, Earnhardt was a second lap down. Earnhardt was still in 37th when the day’s most dramatic moment occurred on Lap 37. 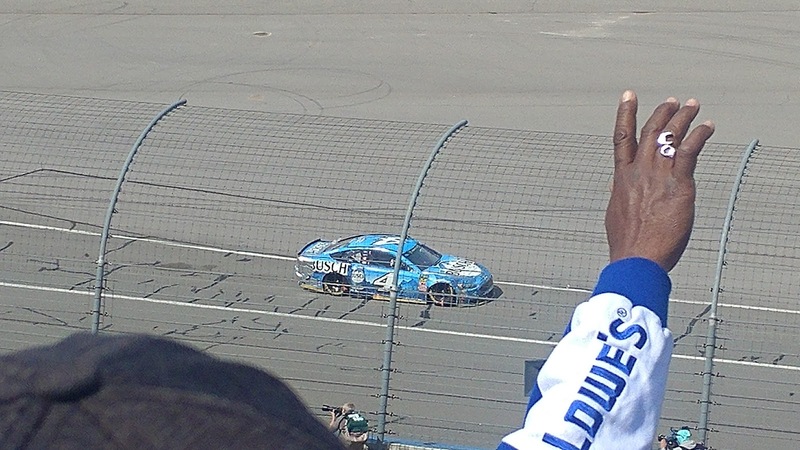 It involved Kevin Harvick, who came into Sunday’s race looking for his fourth win in a row. Coming down the backstretch, Harvick locked fenders with Kyle Larson, steering Harvick’s #4 Busch Beer Ford hard into the outside wall with the right-front of his machine. Harvick veered to the inside, the rear TV panel peeled away from the rear clip, and somehow managed to avoid running into the inside barrier. Even with NASCAR’s “Crash Clock” extended to six minutes, it looked unlikely that Harvick would be able to run any further. If he did, with Earnhardt and the rest of the field still running, the result would have been Harvick’s first-ever last-place run in a Cup points race, dating back 615 starts to his series debut at Rockingham one week after Dale Earnhardt’s passing in 2001. Harvick did, however, manage to drive to pit road, where the crew began patching up the car. Several large silver patches of tape were added to the right-rear, holding the TV panel in place, while crews addressed the heavy damage to the right-front. Radio transmissions indicated that the toe-end was knocked out more than an inch and a half. Combined with the aerodynamic damage to the front valence, this would prove devastating at any track, particularly a downforce track like Fontana. 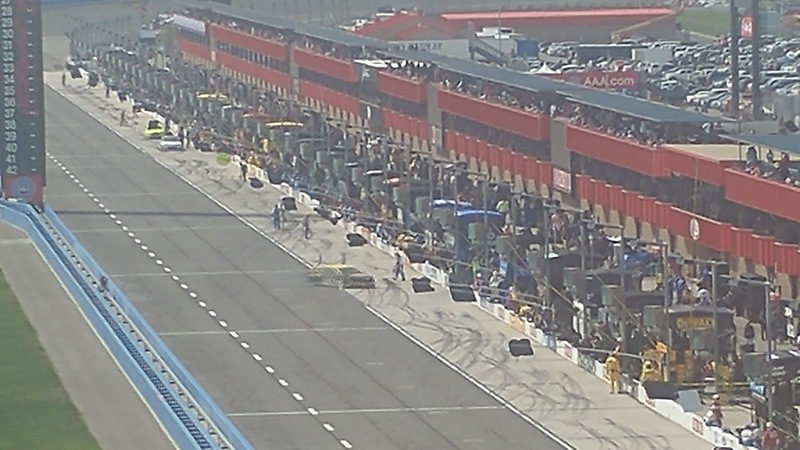 Harvick returned to the track under yellow, then made a second stop for additional repairs. 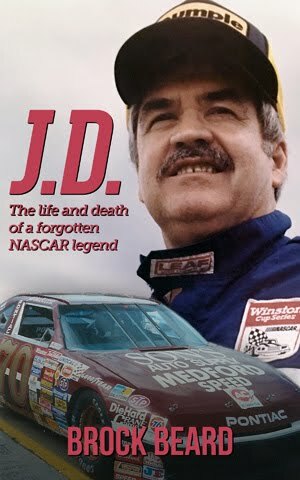 He lost two laps in the bargain, taking last from Earnhardt on Lap 43, and was rolling down pit road when the race restarted. Surprisingly, Harvick’s car still showed enough speed to contend with the tail end of the field. On Lap 45, just two laps after rejoining the field, he passed Earnhardt for position, dropping the #00 back to last. By Lap 54, when Earnhardt lost a third lap, Harvick was passing more cars, running interference to keep himself from losing another lap. Harvick re-took last from Earnhardt on Lap 65 when the crew made more repairs under the caution at the end of Stage 1, adding black tape to the silver already used. The crew instructed Harvick to repeat his previous restart, waiting for the restart to rejoin the field at the back of the pack. At this point, Harvick was now five laps down to the leaders, and another half-lap behind the tail end of the field. But, once again, he caught up. On Lap 75, he caught and passed Earnhardt, though this time it wasn’t for position as the #00 was two circuits ahead. As Earnhardt continued to struggle for speed, however, he slowly fell into Harvick’s clutches once more. On Lap 92, following another round of green-flag stops, Earnhardt was now six laps down to Harvick’s seven. 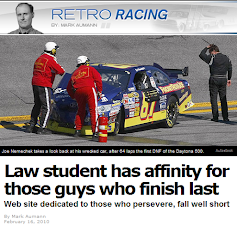 It wasn’t until Lap 109 that Trevor Bayne entered the last-place picture. During the green-flag stretch that preceded it, Bayne was locked in a tight battle with teammate Ricky Stenhouse, Jr., his #6 holding the high lane. On that 109th circuit, just as Paul Menard came down pit road, Bayne’s car apparently cut down a tire and slammed the outside wall between Turns 3 and 4. The car ground to a stop, then rolled down the banking and drove down pit road. Bayne spoke with his crew, saying “That’s the hardest hit I’ve ever had in my life.” He also hinted at a possible concussion, saying he didn’t know how he drove the car down pit road, but was conscious enough to warn his crew that he didn’t have any brakes. The car stopped in his stall and the crew briefly worked on repairs. The crew chief told Bayne to shut the car off, and on Lap 110 had Bayne drive to the garage. 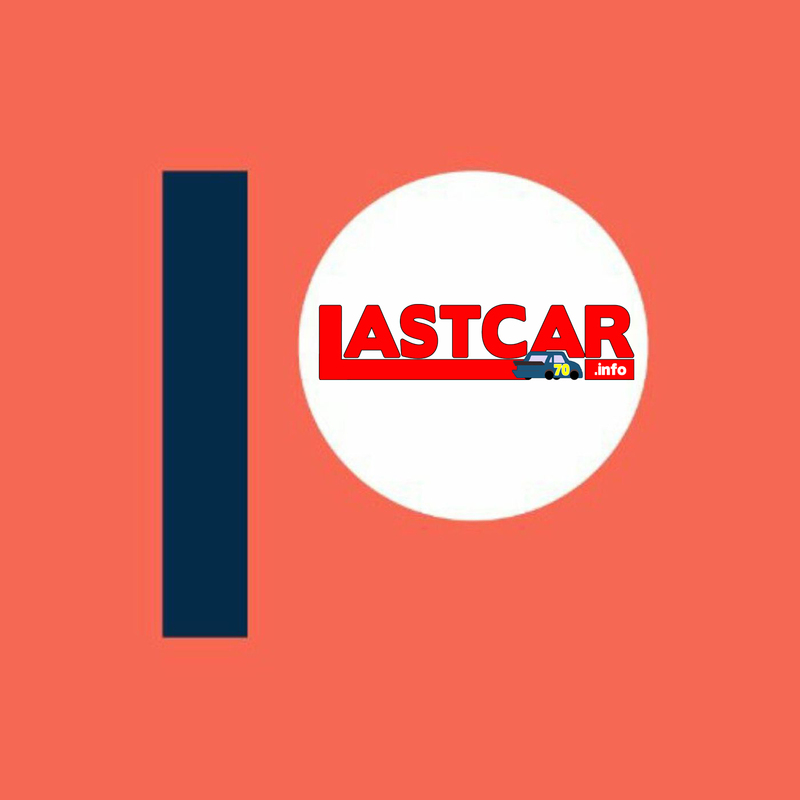 The next time by, on Lap 111, Bayne re-fired the engine and drove down a couple stalls to the next garage entrance, the first car to pull behind the wall. He was 32nd at that moment, two laps down. He took last on Lap 115. 36th fell to Earnhardt, who was once again passed by Harvick not long after Bayne’s caution. Earnhardt finished 11 laps down to race winner Martin Truex, Jr., and news soon broke that he had been released from StarCom Racing, to be replaced by Landon Cassill. Harvick not only passed Earnhardt to take 35th, but came home two laps in front of Earnhardt and managed to finish under power. Seven other times, Harvick has finished next-to-last in a Cup Series race, including on July 2, 2016 when he was collected in a multi-car pileup at Daytona, only to be classified one spot ahead of last-placer Chris Buescher on the same lap. Sunday’s finish, though two spots away from last, may have been his closest escape yet. Rounding out the Bottom Five were Sorenson and Hill, both seven laps down with their cars intact. Sorenson stood out a little more on Lap 94, when he came off pit road with chrome rims identical to those once used by Michael Waltrip Racing. 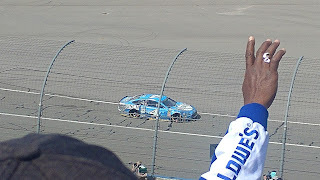 *This marked the first last-place finish for car #6 in a Cup Series race at Fontana. Both the car number and team won at the track once before when Mark Martin took the checkers on May 3, 1998.